Steadfast Plants, LLC develops new varieties of Heuchera sp. and related genera for commercial markets. Potential varieties are currently being trialed by nurseries and plant branding companies. As of 2019 we are selling some of our new varieties directly. We have developed several varieties over the years which are strong performers in our backyard breeding program (“backyard breeding” is a pejorative in the industry, but I can handle the truth) but are not suitable for commercialization (e.g. they don’t distinguish themselves in a pot on a bench in a big box store on Mother’s Day). Generally speaking, such selections from our breeding program, that have also endured five years or more in my Iowa garden, are eligible to be in our SteadfastTM Series of Heucheras. Here are a few! This one is named after Cindy Haynes, an associate professor of Horticulture at Iowa State University (who, incidentally, I have been married to for 27 years). She was, and is, my inspiration for getting into ornamental horticulture. I have been told that it is perilous to name a plant after a person (in case someone has unkind words about it), but I bet she can handle it. I grew a bunch of Heuchera villosa seedlings from Tennessee together with Heuchera ‘Palace Purple’ in my backyard in Des Moines, Iowa in 2004. (Despite what the label might say, when you buy ‘Palace Purple,’ it is a Heuchera villosa). Seeds were harvested and bulked from these open-pollinated plants. Over the next few years seedlings were grown from this seed lot, open-pollinated, and grown again. In May 2007, I noticed, among 45 seedlings, one slower-growing, dark-leaved individual with shiny, variegated leaves. This plant was christened with the (awful) provisional, pet name of ‘Metallicas Variegata.’ Over the next few years I propagated this plant by division and cuttings and found that the variegation was not entirely stable, but never disappeared altogether. The most variegated seedling was selected for further propagation. My 18-month old son (at the time) managed to sit on this specimen on 5/14/2009 (yes, I recorded the incident) and damaged it completely back to the ground. This plant recovered, but the incident lead me to abandon any significant attention to this selection for several years. But it kept hanging around in my landscape, and in pots, and put on the beautiful foliage display (pictured) in the spring year after year — and to a lesser extent in the fall. In 2016, I began giving a few specimens away and am now bulking it up to distribute in exchange for supporting the plant sync. ‘Cindy’ does not have showy flowers. In fact, they are best removed. However, I have found it to be the most vigorous and durable of all the variegated selections in the commercial trade that I have tried. Having said that, it is less vigorous than the species H. villosa, even though it has a high proportion of H. villosa in its pedigree. Variegation often reduces vigor relative to unvariegated counterparts. ‘Cindy’ requires division and selection of the best sectors to maintain the best variegation, but this is not difficult, and they need to be divided periodically anyway. 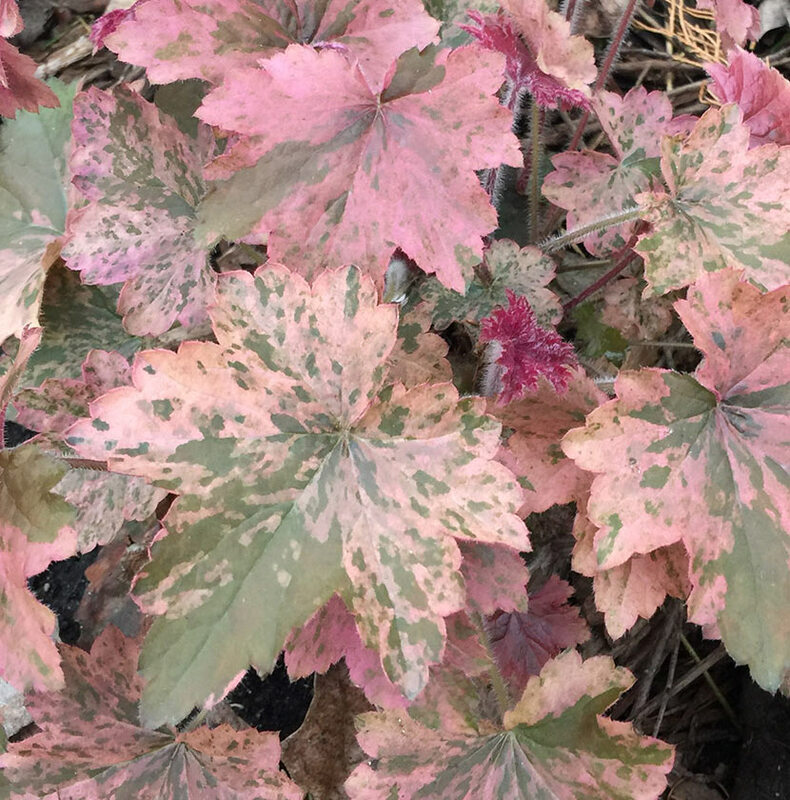 The variegation display is reduced in the summer, but this is true for many of the fancy foliage traits we have come to identify with Heuchera. All of these observations are from growing in containers or from a mostly shaded environment on a north-facing slope in the rich, heavy soils of my backyard in Central Iowa. As with most Heuchera, it would probably perform better in a rock garden or other situation with sharp drainage. In truth, I have no idea how it will perform anywhere else but my garden, because I haven’t tried. But its pedigree and my experiences are hopeful indicators. ‘Cindy’ is not available commercially. The only way to get this variety is directly from Steadfast Plants, LLC. It is difficult to propagate this variety by cuttings or divisions so suppliers are always very limited. We have no stock for sale in 2019. We are working on ways to provide these plants, when available, in consideration of support for the plant sync. To see how Steadfast Plants, LLC relates to the plant sync see FAQs..